Dama de Noche golf course in Malaga. Golf in Costa del Sol, Spain. La Dama de Noche was the first European club to open 24 hours a day and is the only course on the Costa del Sol where you can play at night on floodlit grounds. 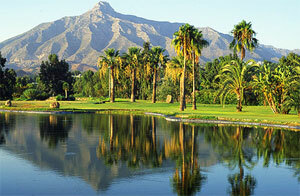 La Dama de Noche is a 2.700-metre par-36 nine-hole course, situated next to Puerto Banus, Marbella, opened in 1991. It´s designer was Ramon Iruretagoyena. Apart from its powerful night lighting system, which allows enthusiasts to enjoy a game during the calm hours of the night, La Dama de Noche is known for its refined appearance, achieved through the palm trees and other species that mark the course. It is a comfortable course but not free of difficulties, without rough, which allows immediate location of the ball and the fluidity of the game. In the vicinity of the course are located luxury homes. Owners of these homes and family members have free access to the golf course. This golf course is located in the heart of the Golden Mile just minutes from the beach and the most prestigious hotels, restaurants and boutiques of Marbella. Address: Camino del Angel, Río Verde, 29600 - Marbella. How to get there: This course is situated between Marbella and Puerto Banus, in an area known as the "Golden Mile" (Boulevard del Principe Alfonso von Hohenlohe). We can get there on the highway A-7 which then branches at the height of Marbella into the national road N-340 entering the city.